HOPE – The Hope School Board got some good news Monday night concerning the $7.9 million bond refinance program it has undertaken to expand Beryl Henry Elementary School and pay for roofing projects. Stephens, Inc., representative Jason Holsclaw told the board that favorable bids for the bond refinance dropped anticipated interest rates for the 16-year bond issue and saved the district some $757,000 in unrealized interest payments. “The hope was that the market would stick with us, and it did,” Holsclaw said. He said of the four bids submitted on the bond program, the low bid was 1.85 percent, down significantly from the 3.15 percent of the original issue. The refinance program pays off 2009 series bonds and refinances funds from 2012 series bonds. Holsclaw said the district would save $485,000 the first year in unrealized interest payments, and that the bulk of the unrealized payments would occur in the first two years of the refinance program. “So, all we have done is lowered your interest rate,” he said. The board voted unanimously Monday night to accept the refinance bid of Raymond James and Associates. The bond refinance proceeds are to be used for academic-related purposes only, Holsclaw said, and will reduce the total of the refinance from $7.9 million to $7.7 million. The first phase of the BHE project has been completed with renovation of office space in the main building. The second phase got underway this summer after ground breaking ceremonies for some 25,000 square feet of new academic space and a 3,000-square foot multipurpose/safe room. The McDougal Group, of Texarkana, is the primary contractor for the project. The BHE renovation and construction will require about $6 million of the refinance program, which was approved by voters in 2015. Also Monday night, Superintendent Bobby Hart commended three people who have been positive models for the district, including Yerger Middle School coach Terry Daniels, whose quick thinking saved the life of a student. Hart said shortly after the beginning of the school year, a student collapsed in the bus line at YMS and Daniels administered CPR prior to the arrival of paramedics. “His quick action and thinking surely did save a life,” Hart said. Hart also commended Hope High School baseball/tennis coach Billy Rook upon being named the Hope Star “Best Coach” in Hempstead County. “We certainly appreciate all of his hard work,” he said. Hart also recognized Beryl Henry Elementary School fifth grade student Jesse Ohmart, winner of the “Strive for Five” poster design contest at BHE. The design concept Ohmart submitted will be incorporated into the district’s “Strive for Five” student attendance initiative, he said. Hart said the district has rolled out the attendance initiative through a print and broadcast media campaign, as well as an online parent survey. He said parents may access the survey by visiting any of the campus websites or the district website at www.hpsdistrict.org and clicking on the item in the “news” section of the page, where a link is embedded in the news story about the survey. Hart also commended the work of the HHS administration in developing a “school improvement plan” for the campus which will be submitted to the Arkansas Department of Education in October. The 10-question survey is free and anonymous. --Adopted an executive budget summary for 2016-2017 which reflects a slight increase in the ending balance for the year at some $3.8 million, indicative of step and classified salary increases approved by the board last year. --Adopted an Act 1120 resolution which reflects salary adjustments within the budget of five percent or greater as required under the statute. --Approved the bid of Progressive Technologies, of Little Rock, for additional monitoring cameras at Hope High School at a cost of $77,252.34. --Approved facilities use requests from Dancing Diamonds, of Texarkana, and Wildcat Football, of Hope. --Adopted an annual Statement of Assurances required by federal law. --Adopted a request for waiver for a librarian at YMS, and employment of a pre-kindergarten teacher at ABC Pre-School under a modified contract. --The board also employed Phylesha Lewis, HHS secretary; Montress Magee, CPS paraprofessional; Kayla White, HAPS paraprofessional; Israel Diaz, HHS paraprofessional; Jessica Elder, HHS paraprofessional; and Gina Karber, CPS parent center. The resignation of CPS parent center paraprofessional Alex Chavez was also accepted. 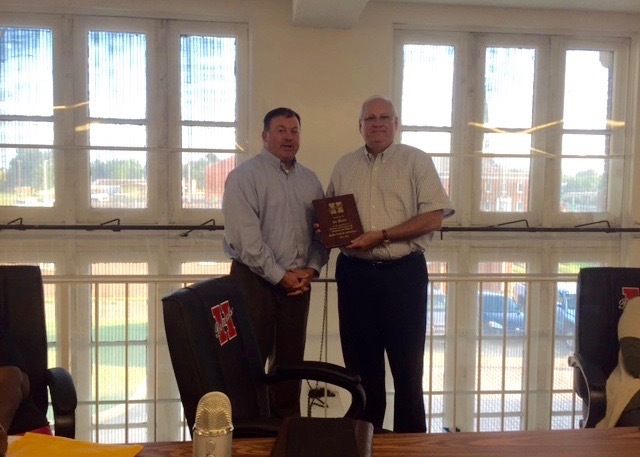 --The board also honored the 20-year service of Board President Joe Short, who retired from board service Monday night.